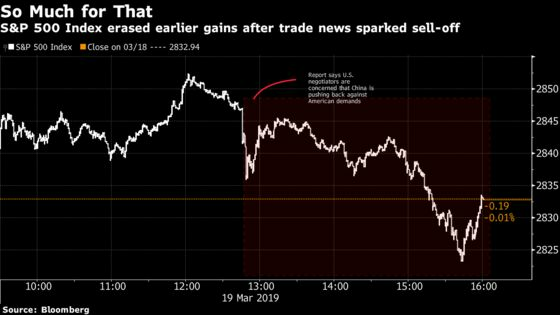 A rally in equities sputtered out after a report that U.S. and Chinese negotiators remain at odds on aspects of their current trade talks. Treasury yields narrowed and Texas crude declined. The S&P 500 Index ended the session little changed Tuesday on word that Trump administration officials are concerned that China is pushing back against U.S. demands. Earlier in the session, the benchmark had topped 2,850 for the first time since October. The trade news threatens to overshadow other developments investors have been watching this week, including a rate announcement from the Federal Reserve and the latest chapter in the Brexit saga. The Fed’s dovish shift in recent months has helped reignite a global equity rally on bets that policy makers will act to support growth. Earlier, the Stoxx Europe 600 Index advanced after a quiet start, while equities posted modest losses in Japan, China and Australia, but rose in Hong Kong and India. The pound gained on word that European Union leaders are planning to offer the U.K. a conditional Brexit extension at this week’s summit in Brussels, giving Prime Minister Theresa May one more chance to get her deal through Parliament. The euro extended an advance after data showed German investor confidence rose for a fifth straight month. The Bank of England also meets this week, though given the backdrop of Brexit uncertainty investors see little chance of a policy shift. In Asia, central banks in Indonesia, the Philippines and Thailand hold meetings amid expectations they too will stand pat. Policy makers could signal some willingness to cut in coming months as low inflation sweeps across the region. Elsewhere, West Texas crude fell. Gold gained. Company earnings this week include FedEx, Tencent, Hermes, Tiffany, Micron, Nike and PetroChina. On Wednesday the Fed is expected to hold interest rates steady, announce plans for the end of asset roll-off from its balance sheet, and lower projections for the number of interest-rate hikes this year. Euro zone purchasing manager survey numbers on Friday will give an indication of the health of the region’s industrial and service sectors. The S&P 500 Index fell less than 0.05 percent as of 4:03 p.m. New York time. The Stoxx Europe 600 Index jumped 0.6 percent. The U.K.’s FTSE 100 Index climbed 0.3 percent. The MSCI Emerging Market Index gained 0.1 percent to the highest in more than seven months. The Bloomberg Dollar Spot Index fell 0.1 percent to the lowest in almost three weeks. The euro climbed 0.2 percent to $1.1359, the strongest in more than two weeks. The British pound rose 0.1 percent to $1.3272. The Japanese yen climbed 0.1 percent to 111.39 per dollar. The yield on 10-year Treasuries gained one basis point to 2.61 percent. Germany’s 10-year yield rose one basis point to 0.10 percent, the highest in almost two weeks. Britain’s 10-year yield decreased one basis point to 1.186 percent. West Texas Intermediate crude fell 0.4 percent to $58.83 a barrel. Gold gained 0.2 percent to $1,306.57 an ounce.